Chi Omega (ΧΩ, also known as ChiO) is a women's fraternity and a member of the National Panhellenic Conference, the umbrella organization of 26 women's fraternities. Chi Omega has 181 active collegiate chapters and approximately 240 alumnae chapters. Since its founding in 1895, the fraternity has initiated over 355,000 members with more than 28,000 undergraduates added each year, making it the largest women's fraternal organization by membership. Chi Omega's national headquarters are located in Memphis, Tennessee. Chi Omega was founded April 5, 1895 at the University of Arkansas by Ina May Boles, Jean Vincenheller, Jobelle Holcombe, and Alice Simonds, with the help of Dr. Charles Richardson (an initiate of the Kappa Sigma Fraternity). This founding chapter is called the Psi Chapter. It first expanded in Fall 1898 with Chi chapter at Jessamine College; located in Nicholasville, Kentucky and Hellmuth Ladies' College, located in London, Ontario. Both chapters were transferred to other schools in 1903. By its 10th anniversary, in 1905, and with the support of Alumnae and Dr. Richardson, Chi Omega had installed 17 chapters throughout the United States. Chi Omega joined the National Panhellenic Conference in 1903. From 1947-1973, Chi Omega's headquarters were in the private home of two alumnae in Cincinnati, Ohio. In 1973, Chi Omega moved to the 33rd floor of Carew Tower, the tallest building in Cincinnati. Chi Omega was the first women's Fraternity to have an Executive Office in an Office Building. In 1986, the Chi Omega Executive Office was moved to the 31st floor of the same office building, Carew Tower, until their move to the present location in Memphis, Tennessee in December 1993. Chi Omega Sorority House at Ohio University. In the late 1990s, the leadership in Chi Omega researched opportunities for a partnership with a national philanthropy, choosing the Make-A-Wish Foundation as their official philanthropy since 2002. Since the start of this alliance, Chi Omega has raised more than 19 million dollars and has volunteered over one million hours for Make-A-Wish and contributed more than a million dollars annually. Despite being a women's organization, Chi Omega only refers to itself as a women's fraternity instead of a sorority. As such, Chi Omega is the largest women's fraternal organization in the world with over 355,000 initiates and 181 collegiate chapters. The 300,000th member was initiated in 2013. 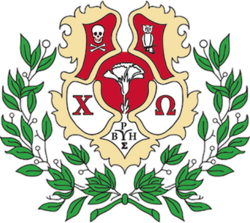 Chi Omega's crest was adopted in 1902. Centered on the crest is a white carnation, with the Chi to the left and the Omega to the right of the flower. Above these symbols are both the skull and crossbones and the owl symbols. Beneath the carnation are the five letters, Rho, Beta, Upsilon, Eta and Sigma. The symbol is surrounded by a laurel wreath. The badge of Chi Omega was regulated and adopted in 1906, allowing only fourteen pearls or diamonds, no other stones to be used. It is a monogram of the Greek letter "Chi" superimposed over "Omega." That badge is to be worn only when wearing professional clothing, above all other pins and over the heart. Both badge and crest may only be used or worn by initiated members. Chi Omega is an "intergenerational women’s organization" that states its founding purposes as: "friendship, personal integrity, service to others, academic excellence and intellectual pursuits, community and campus involvement and personal and career development". The ethos of the fraternity is embodied in a document known as the Chi Omega Symphony, composed in 1904 by Ethel Switzer Howard of the Xi Chapter at Northwestern University. The fraternity's day-to-day business activities are overseen by the Governing Council; which consists of five elected alumnae, volunteer members, who are elected every two years. The current president of Chi Omega is Shelley Potter. Each chapter of Chi Omega receives at least an annual visit from a National Consultant who aids in the development of the members. Since 1899, The Eleusis is the official newsletter magazine of Chi Omega, named after the Greek myth. In 1899, it was edited by Ida Pace Purdue and delivered to less than 100 members. The subscription price was $1/year. An account of the founding, histories and pictures of the chapters, and a directory of the members were included in the first issue. In 2013, over 200,000 copies of The Eleusis were mailed out three times per year to collegiate and alumnae members. The Nancy Walton Laurie Leadership Institute of Chi Omega is a leadership training program for collegiate and alumnae members. The sessions include a variety of topics based on personal development, and the program is available at various meetings and events. The Chi Omega Foundation supports the Laurie Leadership Institute. In 1971, the Delta Nu chapter at Dickinson College attempted to recruit an African-American woman as a member, and the national organization refused permission. Delta Nu separated from the national organization over this issue and became an independent sorority. In 2013, the chapter at Pennsylvania State University was shut down after the sorority threw an offensive party insulting Mexican-American culture. National leadership of the sorority released a statement saying the party was not congruent with Chi Omega's values and purpose. In 2013 and 2014, sorority women from multiple chapters at the University of Alabama – including Chi Omega, Delta Delta Delta, Pi Beta Phi, Kappa Delta, Alpha Gamma Delta, Alpha Omicron Pi, and Phi Mu – alleged that either active members or some of their alumnae had prevented them from offering membership to black candidates because of their race. An anonymous Chi Omega member told the school newspaper, The Crimson White, that their university-employed rush adviser dropped a black girl who received perfect scores after the first round of recruitment. Afterwards, chapter members requested that the Chi Omega national headquarters investigate for racial discrimination, and one member of the chapter's executive board (the chapter's philanthropy chair had been fighting for the girl) moved out of the chapter house and resigned her membership. Students held a campus march to integrate Greek life on campus, and following media and national outcry, the university held a second round of recruitment in hopes of offering membership to more women, including black women. In 2014, the chapter at the University of Central Florida was suspended after allegations surfaced of sorority members blindfolding two pledges (both under 21) and taking them to the woods to drink an entire bottle of rum. According to the police report, one pledge ended up so intoxicated that she injured herself in a fall. Members of the sorority directly involved with the hazing incident later resigned from the sorority. In 2014, a member at the University of Alabama was kicked out of the sorority after releasing a racially offensive picture that included a racial slur on social media, celebrating that the chapter had not offered membership to any black women that year. The university's president and sorority's leadership both released statements condemning the photo and acknowledging the importance of embracing diversity. In 2016, a sorority member at the University of Nebraska at Omaha was kicked out of the sorority for posting pictures wearing her sorority letters in her Tinder profile. The incident made it to a Good Morning America segment where she states she was unfairly treated and targeted by several members of the sorority. In 1978, serial killer Ted Bundy entered the Chi Omega sorority house at Florida State University in Tallahassee, Florida on January 15. Ted Bundy attacked five women, two of which were killed (Lisa Levy and Margaret Bowman). ^ "Chi Omega at University of South Alabama". chiomega.com. Retrieved 5 April 2018. ^ "Stats – Chi Omega". chiomega.com. Retrieved 2018-02-10. ^ "History – Chi Omega". chiomega.com. Retrieved 2018-07-09. ^ a b "What We Stand For – Chi Omega". www.chiomega.com. Retrieved 5 April 2018. ^ "The Eleusis of Chi Omega". 5 April 2018. Retrieved 5 April 2018 – via Google Books. ^ "NPC: Joining dates of members". npcwomen.org. Retrieved 5 April 2018. ^ "Make-A-Wish® America: Current Sponsors". wish.org. Retrieved 5 April 2018. ^ a b Simpson, Ethel. "Chi Omega". Encyclopedia of Arkansas. Retrieved 3 June 2015. ^ a b "Chi Omega: Symbols and Insignia". purdue.edu. Retrieved 5 April 2018. ^ "History – Chi Omega". chiomega.com. Retrieved 5 April 2018. ^ "What We Stand For – Chi Omega". www.chiomega.com. Retrieved 5 April 2018. ^ "Meet Our Leaders – Chi Omega". www.chiomega.com. Retrieved 5 April 2018. ^ "The Supreme Governing Council of Chi Omega – Chi Omega". Retrieved 2019-02-26. ^ "The Nancy Walton Laurie Leadership Institute of Chi Omega". Chi Omega. Archived from the original on 2016-01-24. Retrieved 2016-02-08. ^ Getty, Matt (2018). "Looking back to move forward". Dickinson Magazine. 95 (4): 22–24. ISSN 0271-9134. ^ Kingkade, Tyler (18 February 2014). "Penn State Sorority Closes 14 Months After Controversy Over Racist Photo". Retrieved 5 April 2018 – via Huff Post. ^ a b Webley Adler, Kayla (2014-08-06). "Revolution on Sorority Row". Marie Claire. Retrieved 2018-06-27. ^ Gladu, Alex (2013-11-13). "The Truth About Racism at Southern Sororities". Her Campus. Retrieved 2018-06-27. ^ Brown, Melissa (2013-09-11). "Alabama sorority alumnae, advisers blocked black rushees, students say". AL.com. Retrieved 2018-08-26. ^ "Blind hiker shares his story of reaching peak potential". wesh.com. Retrieved 5 April 2018. ^ "UCF sorority Chi Omega suspended after hazing allegations". orlandosentinel.com. Retrieved 5 April 2018. ^ Kingkade, Tyler (19 August 2014). "University Of Alabama Sorority Kicks Out Member For Sending Racist Snapchat". Retrieved 5 April 2018 – via Huff Post. ^ Dries, Kate. "UofA Student Posts Snapchat Bragging Her Sorority 'Got NO Niggas!!!!!' [Updated]". jezebel.com. Retrieved 5 April 2018. ^ Good Morning America (13 April 2016). "Sorority Girl Kicked Out for 'Risque' Tinder Photo". Retrieved 5 April 2018 – via YouTube. ^ Maddox, Malorie. "Update: Sorority girl says she was forced out, Chi Omega responds". wowt.com. Retrieved 5 April 2018. ^ * Rule, Ann (2009). The Stranger Beside Me (Paperback; updated 2009 ed.). New York: Pocket Books. ISBN 1-4165-5959-0. Wikimedia Commons has media related to Chi Omega.